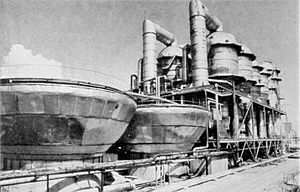 Shevchenko BN350 desalination unit situated on the shore of the Caspian Sea. Desalination means any process that removes the excess salt and other minerals from water in order to obtain fresh water suitable for animal consumption or irrigation. If almost all of the salt is removed for human consumption, sometimes the process produces table salt as a by-product. Desalination of brackish water is done in the United States in order to meet treaty obligations for river water entering Mexico. Several Middle Eastern countries have energy reserves so great that they use desalinated water for agriculture. Saudi Arabia's desalination plants account for about 24% of total world capacity. The world's largest desalination plant is the Jebel Ali Desalination Plant (Phase 2) in UAE. It uses multi-stage flash distillation, dual-purpose and it is capable of producing 300 million cubic meters of water per year. The traditional process used in these operations is vacuum distillation—essentially boiling it to leave impurities behind. In desalination, atmospheric pressure is reduced, thus lowering the required temperature needed. Liquids boil when the vapor pressure equals the ambient pressure and vapor pressure increases with temperature. Thus, because of the reduced temperature, low-temperature "waste" heat from electrical power generation or industrial processes can be employed. Water is evaporated and separated from sea water through multi-stage flash distillation, which is a series of flash evaporations. Each subsequent flash process utilizes energy released from the condensation of the water vapor from the previous step and so on. Multiple-effect distillation (MED) works through a series of steps called “effects”. Incoming water is sprayed onto vertically or, more commonly, horizontally oriented pipes which are then heated to generate steam. The steam is then used to heat the next batch of incoming sea water. To increase efficiency, the steam used to heat the sea water can be taken from nearby power plants. Although this method is the most thermodynamically efficient, a few limitations exist such as a max temperature and max number of effects. Vapor-compression evaporation involves using either a mechanical compressor or a jet stream to compress the vapor present above the liquid. The compressed vapor is then used to provide the heat needed for the evaporation of the rest of the sea water. Since this system only requires power, it is more efficient if kept at a small scale. The principal competing process uses membranes to desalt saline water, principally applying reverse osmosis (RO). The RO membrane processes use semipermeable membranes and applied pressure (on the membrane feed side) to preferentially induce water permeation through the membrane while rejecting salts. Reverse osmosis plant membrane systems typically use less energy than thermal desalination processes. Desalination processes are driven by either thermal (e.g., distillation) or electrical (e.g., RO) as the primary energy types. Energy cost in desalination processes varies considerably depending on water salinity, plant size and process type. At present the cost of seawater desalination, for example, is higher than traditional water sources, but it is expected that costs will continue to decrease with technology improvements that include, but are not limited to, reduction in plants footprint, improvements to plant operation and optimization, more effective feed pretreatment, and lower cost energy sources. The Reverse Osmosis process is not maintenance free. Various factors interfere with efficiency: ionic contamination (calcium, magnesium etc. ); DOC; bacteria; viruses; colloids & insoluble particulates; biofouling and scaling. In extreme cases destroying the RO membranes. To mitigate damage, various pretreatment stages are introduced. Anti-scaling inhibitors include acids and other agents like the organic polymers Polyacrylamide and Polymaleic Acid), Phosphonates and Polyphosphates. Inhibitors for fouling are biocides (as oxidants against bacteria and viruses), like chlorine, ozone, sodium or calcium hypochlorite. At regular intervals, depending on the membrane contamination; fluctuating seawater conditions; or prompted by monitoring processes the membranes need to be cleaned, known as emergency or shock-flushing. Flushing is done with inhibitors in a fresh water solution. Thus the system needs to go offline. This procedure is environmental risky, since contaminated water is rejected into the ocean without treatment. Sensitive marine habitats can be irreversibly damaged. Freeze-thaw desalination uses freezing to remove fresh water from frozen seawater. One method, invented by Alexander Zarchin, used freezing and vacuuming of salt from seawater. Desalination Facts for Kids. Kiddle Encyclopedia.